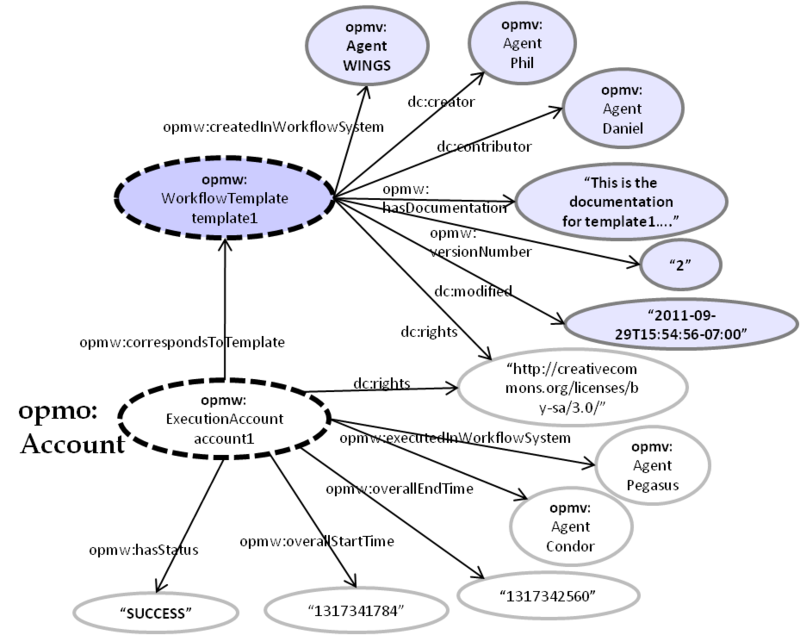 The Open Provenance Model for Workflows (OPMW) is an ontology for describing workflow traces and their templates based on the Open Provenance Model. It has been designed as a profile for OPM, extending and reusing OPM's core ontologies OPMV (OPM-Vocabulary) and OPMO (OPM-Ontology). Since 2013, a standard for provenance has been approved by the W3C. Therefore, OPMW has been updated to extend the standard (PROV-O). It also extends the P-plan ontology, designed to represent scientific processes. This document specifies the classes, properties and dataproperties of OPMW. OPMW is an OWL ontology developed to represent workflow specifications in addition to their workflow execution traces. This requirement was motivated by the goal of publishing workflows of scientific articles and their results. OPMW was initially based on the Open Provenance Model [Moreau el al 11], a widely-used domain-independent provenance model result of the Provenance Challenge Series and years of workflow provenance standardization and exchange in the scientific workflow community. In 2012 OPMW was modified to extended the PROV Standard [PROV], finally approved as a W3C Recommendation by the W3C Provenance Working Group in 2013. PROV has been recognized as a standard for representing and publishing	provenance on the Web, with more than 60 implementations to date. There two main reasons to use OPM and PROV: Both models have already been used successfully in many scientific workflow systems and their core definitions are domain independent and extensible to accommodate application specific purposes. OPM can be considered the basis of the PROV Standard. OPMW also extends the P-plan ontology, which extends PROV to represent scientific processes. Workflow templates can be seen as a specific type of scientific processes, so OPMW adapts and links together workflow execution traces and templates. The Open Provenance Model offers several core concepts and relationships to represent provenance. It models the resources (datasets) as artifacts (immutable pieces of state), processes (action or series of actions performed on artifacts), and agents (controllers of processes). Their relationships are modeled in a provenance graph with five causal edges: used (a process used some artifact), wasControlledBy (an agent controlled some process), wasGeneratedBy (a process generated an artifact), wasDerivedFrom (an artifact was derived from another artifact) and wasTriggeredBy (a process was triggered by another process). It also introduces the concept of roles to assign the type of activity that artifacts, processes or agents played when interacting with each other, and the notion of accounts and provenance graphs to group sets of OPM assertions into different subgraphs. An account represents a particular view on the provenance of an artifact based on what was executed. The PROV model is heavily influenced by OPM. PROV models the resources as entities (which can be mutable or immutable), the steps using and generating entities as activities, and the individuals responsible for those activities as agents. The relationships are also modeled in a provenance graph with seven types of edges: used (an activity used some entity), wasAssociatedWith (an agent participated in some activity), wasGeneratedBy (an activity generated an entity), wasDerivedFrom (an entity was derived from another entity), wasAttributedTo (an entity was attributed to an agent), actedOnBehalfOf(an agent acted on behalf of another agent) and wasInformedBy (an activity used the entity produced by another activity). PROV also keeps the notion of roles to describe how entities, activities and agents behaved in a particular event (usage, generation, etc. ); and provides the means to qualify each of the aforementioned relationships using an n-ary pattern. PROV allows to state the plan associated to a certain activity, although the plan definition itself is out of the scope of the model (since it is not something that necessarily happened). PROV statements can be grouped in named sets called bundles, which are entities themselves (allowing for their provenance to be described). Figure 1: P-Plan as an extension of PROV. 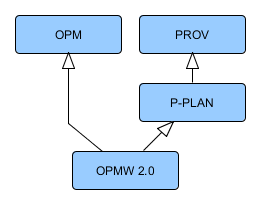 Figure 2: OPMW as an extension of OPM, PROV and P-plan. OPMW also represents another important aspect of the workflows: the metadata of the template and execution itself (attribution provenance). The next sections describe in detail the OPMW extension as it represents the process view provenance and the attribution view provenance. OPMW describes the traces of the execution of a workflow along with the abstract workflow (template) used for its design. The trace is described by extending opmv:Artifact and prov:Entity with opmw:WorkflowExecutionArtifact; opmv:Process and prov:Activity with WorkflowExecutionProcess; and reusing OPM and PROV relationships to link them (opmv:used,	opmv:wasControlledBy, opmv:wasGeneratedBy and prov:used, prov:wasControlledBy and prov:wasAssociatedWith respectively). All the assertions from an execution are grouped in a opmw:WorkflowExecutionAccount, a subclass	of opmo:Account and prov:Bundle that represents the view of the system on the execution. Workflow templates are defined extending P-plan, in a similar way to the traces. 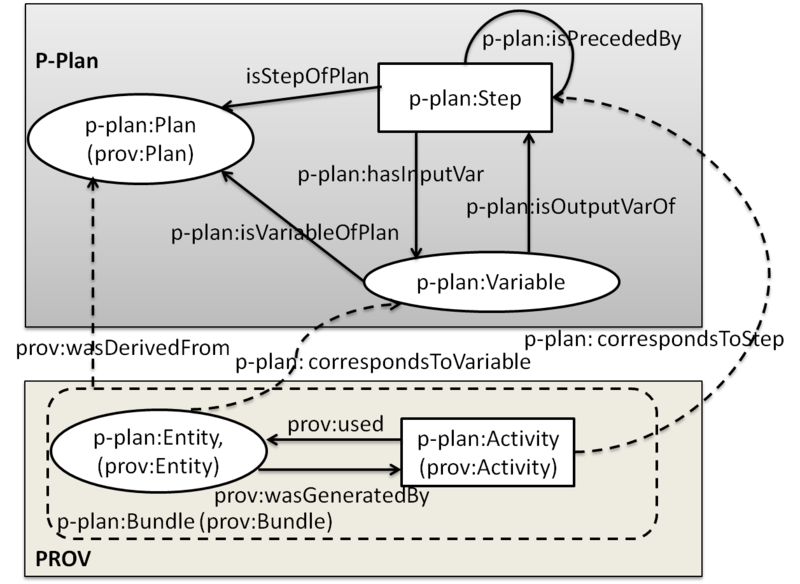 Templates extend the p-plan:Variables with opmw:WorkflowTemplateArtifacts (which can be either opmw:DataVariables or opmw:ParameterVariables) and the p-plan:Steps with opmw:WorkflowTemplateProcesses, which represent an abstraction of the method that is being executed. The opmw:WorkflowTemplateArtifacts are connected to opmw:WorkflowTemplateProcesses by opmw:uses (subproperty of p-plan:hasInput) and opmw:isGeneratedBy (subproperty of p-plan:isOutpuytvaROf) properties. These properties define which type of opmw:WorkflowTemplateArtifact is used by each opmw:WorkflowTemplateProcess and the type of the expected result. The next figure shows a brief example. Figure 3: An example of process view workflow provenance. Figure 3 shows a process view high level diagram of the OPM and OPMW representation of an abstract workflow on the left (a type of workflow template) and a workflow execution on the right. The example workflow shown here has one step (executionNode1), which runs the workflow component (specComp1) that has one input (execInput1) and one output (executionOutput1). Attribution is key for scientists who publish the workflow. Thus, OPMW was designed to include metadata from the specification as well as from the execution itself. Figure 4 shows an attribution view on the provenance of the same workflow of Figure 3. The workflow template contains information of the authors of the original article, the contributors of the workflow, the version, the date of creation and documentation of the workflow (that may include a pointer to the publication). OPMW reuses terms from the Dublin Core (DC) Metadata Terms Vocabulary . The executed workflow links to the workflow systems used to create and execute it, the license, date of start and end of the run and the final status (succeeded or failed execution). This section provides details for each class, property and dataproperty defined by the OPMW Ontology. A Data variable is a workflow template artifact that represents a variable in the workflow specification. A parameter variable represents a description of an input parameter of a workflow step. Parameter variables can only be used by workflow steps. A workflow execution account represents the execution view from the perspective of the system. A Workflow Execution Artifact represents a resource used or generated in the execution of a workflow. A workflow execution process represents the execution of a step in a workflow template. The execution process also describes the specific method used to acomplish the task described in the proces template. A workflow template represents the design of the workflow. In such design, the different steps and inputs don't have to be bound to a specific tool or dataset. It is a generic view of the workflow, which is instantiated in each execution. A workflow template artifact is part of a workflow template. It explains what kind of artifact is used or generated by the process template, along with possible restrictions that it may have. There are two different types of workflow template artifacts: data variables and parameter variables. A workflow process template is an abstraction of the workflow execution process step that aims to describe the method followed by the scientist instead of its specific instantiation. Property to bind an execution account to the system where it was executed (which could be different from the one used for designing its workflow template). Property that binds a workflow execution process to the specific component (code, scripts, etc.) used in the execution. Property that binds an execution account to the template of the whole workflow. The template contains the plan for the workflow. Property that binds a workflow execution artifact to its correspondant workflow template artifact. Property that binds a workflow execution process to its correspondant process template. Property that binds a workflow template artifact to the workflow template process that generates it. Property used to dessignate which workflow Parameter Variables belong to a workflow template. Property used to dessignate which workflow Data Variables belong to a workflow template. Property used to dessignate which workflow template processes belong to a workflow template. Property that binds a workflow template process to the workflow template artifact that generates it. This data property binds a workflow template to the tool used for its design and creation. The tool is represented by its URL. Property that represents the dimensionality of the artifact: 0 is a single file, 1 for a collection, etc. Property that binds a workflow template to its documentation. opmw:hasDocumentation "A copy of the documentation related to this template "^^xsd:string. Property that indicates that the last of the activities in the account finished finished executing before this time. Property that links an execution account to its diagram. The diagram shows how the template has been instantiated with different components. Property used to link an execution artifact to its file name (independently of its URI). Property used to link an execution artifact to the physical location of its file in the server. Property used to annotate a workflow execution artifact with the size in bytes of its file. Property that indicates that none of the processes in the account started executing before this time. Property used to state whether all the processes in an account were successful or not. Property used to link a workflow template to its graphical representation. Property used to state the value of the artifact (in case of being a parameter). Property used to link an execution account to the log file produced by workflow engine where the original execution was performed. Property used to link a workflow template to its original template (encoded in the syntax of the workflow system where it was designed: scufl, owl, etc.). Property that specifies whether a component is abstract or not. Property used to annotate a resource with it version number. [PROV]: 	Lebo, T.; Sahoo,S. ; McGuinness, D.; Belhajjame, K.; Cheney, J.; Corsar, D.; Garijo, D.; Soiland-Reyes, S.; Zednik, S.; Zhao, J. Prov-o: The prov ontology, W3C Recommendation, 30th April 2013. Varun Ratnakar for his help on the naming of some of the properties and his technical support. Khalid Belhajjame, Stian Soiland-Reyes, Simon Miles, Paolo Missier and Jun Zhao for their feedback on the ontology. Silvio Peroni for developing LODE , a tool used to generate most of the cross reference section of the current document. Updated OPMW documentation with the previous existing mapping. opmw:WorkflowExecutionArtifact is subclass of a prov:Entity. opmw:WorkflowExecutionProcess is subclass of prov:Activity. opmw:WorkflowExecutionAccount is subclass of prov:Bundle. opmw:executedInWorkflowSystem is subproperty of prov:wasAttributedTo. opmw:WorkflowTemplateArtifact is subclass of a p-plan:Variable. opmw:WorkflowTemplateProcess is subclass of p-plan:Step. opmw:WorkflowTemplate is subclass of p-plan:Plan. opmw:correspondsToTemplateArtifact is subproperty of p-plan:correspondsToVariable. opmw:correspondsToTemplateProcess is subproperty of p-plan:correspondsToStep. opmw:correspondsToTemplate is subproperty of prov:wasDerivedFrom. opmw:isStepOfTemplate is subproperty of p-plan:isStepOfPlan. opmw:isVariableOfTemplate is subproperty of p-plan:isVariableOfPlan. opmw:isParameterOfTemplate is subproperty of p-plan:isVariableOfPlan. opmw:uses is subproperty of p-plan:hasInputVar. opmw:isGeneratedBy is subproperty of p-plan:isOutputVarOf.